Tarleton State University’s Ally program held its first session of the semester for level I training on Wednesday, September 6. According to the Ally program packet, the purpose of the Tarleton Allies program is to provide a safe haven, a listening ear, and visible support for the lesbian, gay, bisexual, transgender, and questioning/queer persons at Tarleton. The Ally program was redesigned in 2012 to help students learn more about the LGBTQ community and to provide support for those individuals. According to tarleton.edu, the level I workshop explains what it means to be an Ally, the specific responsibilities, the benefits, how to be a better ally to members of the LGBTQ+ community, and provides basic information about LGBTQQUIAP identity. 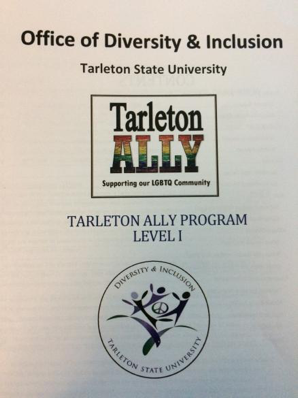 Those who attend Tarleton’s Ally training receive this packet which explains it’s goal to support students who are a part of the LGBTQ+ community. The letters in LGBTQQUIAAP stand for: lesbian, gay, bisexual, transgender, questioning, queer, intersex, asexual, ally, and pansexual. In order for an individual to become an Ally, they must attend an Ally training, hosted by a trained facilitator. After training is complete, participants have the option of signing an Ally contract. Allies who sign the contract are eligible to participate in continuing sessions, as well as group events and collaborations with LGBTQ+ groups on campus. After signing the contract, the individual will receive an Ally placard and a rainbow ribbon pin. These symbols play an important role in the Ally program. They identify the Ally as an individual willing to provide a safe space, respectful listening, and support for the LGBTQ community. As an Ally, there are additional training opportunities for level II and level III training that will allow the individual to choose their level of advocacy and visibility as an Ally. Program specialist, Emily VanKirk, explains why she chose to be a spokesperson for the Ally program. “I have firsthand experience that tells me that the program is necessary and I want the campus to be a safer and better place for all students,” VanKirk said. “For the most part, people seem to really enjoy [the Ally program]. Occasionally, people feel pressured because they’re worried about religious conflicts of interest, but students really like it and it has a dedicated staff support,” VanKirk said. Membership in the Tarleton Allies program is open to anyone who is willing to provide a supportive environment for LGBTQ+ persons. VanKirk encourages students to join the Ally Program if they are interested in learning more or becoming a safe space for the LGBTQ+ community. “It’s open to any member of the Tarleton community. We would love to see folks and answer any questions. We are here to be a resource,” VanKirk said. Each level of training has a few sessions each semester. For more information, please email the Office of Diversity and Inclusion at diversity@tarleton.edu, or call (254)968-9488.